Screenwriter: “Life-Swap” (w.t. )”, Philly-One Productions. Associate Producer: Eustress Entertainment, LLC/ Bent Street Films – “Solomon Dasko”. Promotions and Content Producer: Office of Cable Television, DC. Associate Producer: Travestee Films – “The City of Lost Souls”. Script Supervisor: Travestee Films/Bello Talent Management – “Just Listen”. 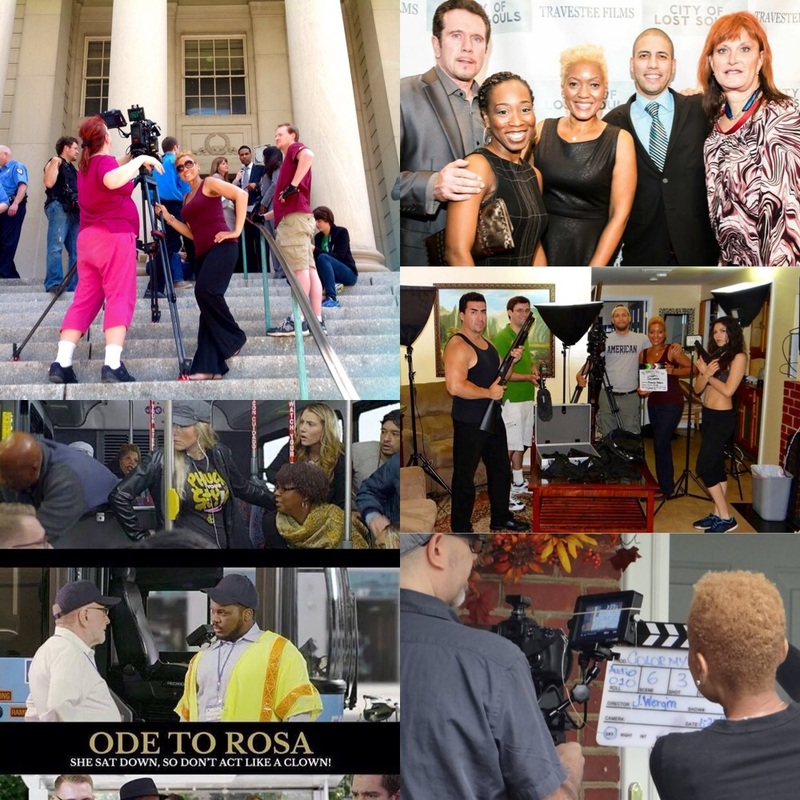 Script Supervisor: Eustress Entertainment, LLC – “Ode to Rosa”. Script Supervisor: A Key Unturned Cinema – “Color My World”. Talent Associate: BELLO TALENT Management. Producer, Researcher and Camera Operator for Documentary: “Party Notions”. Dialog Consultant/Writer, Short Film: Black Women for Positive Change, Non-Violence Project. Script Writer, Social Media Manager, Event Planner: Creative Expressions, THE BRIDGE DC. Guest Blogger, and 2015 Film Festival Judge: Skyline Indie Film Festival. Stations Relations Associate: DeShields Associates. Content, and Promotional Writer: Woo Couture Bridal Boutique. Media Correspondent: Comedy Supreme Series. Documentary Film Reader – evaluated documentary proposals and works-in-progress: Pacific Islanders in Communication. Distribution Consultant: Documentary – “Continental Africans in WWII”. Public Relations and Media Specialist: ONYC® Hair International. Project Manager: DASH Coordinating and Marketing, LLC. Social Media Strategist: RICH Face International, Professional MUA. Blog Writer and Social Media Associate: Elite Strategic Business Solutions, LLC. Social Media Marketing and Promotions Strategist: Eagle Design Printing and Promotions, LLC. Diane just can’t keep this to herself. Her writings are not only available here, but can be found elsewhere. Therefore, she collaborates with others in need of written content. I. Diane is a GHOSTWRITER for Fictional Romantic Content, and various EBooks. Publishers and Distributors have contacted me to supply their needs for stories that are conversational, enjoyable to read, and engaging. From love that reached across “the color line” of race and ethnicity, to fondness that organically grew as a result divine fate, to books regarding the importance of civic duty, to inspirational Ebooks which gives one the permission to be completely true to oneself, and beyond. “Diane, Really amazing story. Love the style and tone of it. Great job!” ~ Harry W.
“Incredible client! Extremely good work. VERY easy to work with. Great communication skills. And finally just an amazing person in general 🙂 Would very highly recommend and will definitely use again!” ~ Abe D.
“Diane is wonderful to work with. She is a great and creative writer and is extremely punctual with turn around time commitments. She is also very responsive and eager to keep the client very satisfied. I would highly recommend Diane! She is wonderful!” ~ Janine A. “Diane, you surpassed what I expected.” ~ Eric S.
Unfortunately for contractual reasons, I am unable to reveal these particular stories I created as a GHOSTWRITER. However, please read my original Creative Writing work; “Short Stories on Kindness” HERE, AND “Life Passages” Short Story Series HERE. ONYC Hair and Beauty: Why Not, EAT PRETTY?!? ONYC Hair and Beauty: Crank It Up – Inside Out! ONYC Hair and Beauty: Homemade and Simple ~ A Natural Way to Go! ONYC Hair and Beauty: Protein Vs Non-Protein Hair Care – Which Is Best for You? What Stories can I help You Tell, Manage, or Promote?